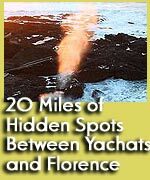 (Oregon Coast) – It’s time for freaky facts about the Oregon coast, kids. Each week in December and January, BeachConnection.net will release a horde of offbeat, odd, funky, fun or just amusing tourism tidbits about the coast – from the worlds of science, history, nature, weather or just interesting trivia. It’s a digital trip to the coast you won’t soon forget. This week, you’ll find out about some freaky fish, a central coast hotel’s oddball history that involved a celebrity and a cult, the “ghost forest” of Neskowin and the infamous legend of Florence’s exploding whale. Who’s That Famous Man with the Pink Leisure Suit? Did you know that singer Pat Boone used to have an interest in a hotel in Waldport? The relationship to the hotel is unclear, but in the early 70's it was called the Pat Boone Inn, located in the Bayshore district. The marquee even featured a picture of Boone wearing - get this - a pink leisure suit. In the late 70's it became the Bayshore Inn, and the Heaven's Gate cult held a gathering there (the UFO cult that became infamous in the 90's for committing mass suicide in California). For a while in recent years, it was called the Evening Star Hotel, then briefly returning to the name Bayshore Resort, until that venture failed. Currently, it’s the big Howard Johnson’s hotel. Jim King, a former manager at one of the restaurants in the hotels long lineage, grew up in the area and told BeachConnection.net he attended the Pat Boone Motel's opening ceremonies in the late 60's. He remembers Boone being there. These underwater weirdos inhabit our coastal region, and many of them you can spot at the Seaside Aquarium. A colorful title, to be sure; but its name is actually upstaged by the appearance of this most unique and wondrous looking critter. A close cousin to the Snailfish, Lumpsuckers get their name from their habit of clinging to rocks and other objects with a small disk found on the breast of the fish. Mosshead Warbonnets occupy shallow tide pools and often hide inside of empty shells or small crevices. They will even take refuge in glass bottles which have been discarded. They can reach a maximum length of 6 inches. 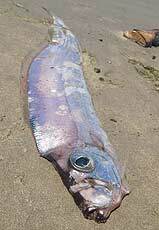 A most remarkable specimen, the Prowfish is the only member of the family Zaproridae. 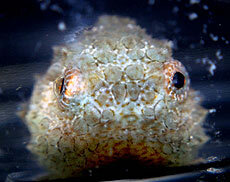 Juvenile Prowfish live in the middle levels of the water column (the vicinity of their preferred prey, the jellyfish). They have been observed hiding in the bells of jellyfish if threatened or approached by a predator. As adults, Prowfish spend the majority of their time on or near the bottom of the ocean, in depths of up to 2,000 feet. 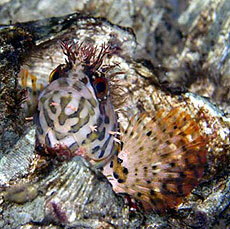 The white and blue fringes on the head of the Prowfish are sensory pores which help the fish perceive its surroundings. Grunt Sculpins range all along the Pacific Coast, from Alaska to Northern California, and can be found in shallow, intertidal waters to depths of over 500 feet. These fish rarely swim, preferring instead to use their pectoral fins to "hop" around sandy or rocky bottoms, rooting for food with their elongated "snout". 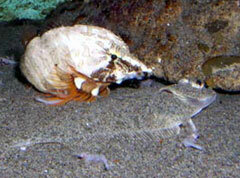 If removed from the water, Grunt Sculpins will actually produce grunt-like sounds. Scientific Name: Trachipterus altivelis Family: Ribbonfish (of the four different species of ribbonfish on our coast, the King-of-the-Salmon is the largest). Size: Up to 6 feet. One of these washed up on Sunset Beach this year, clocking in at exactly six feet. The eye is nearly 3 inches across. Their range is from Alaska to Baja, California and off the coast of Chile, usually living 500 feet to 1,600 feet in depth. Diet: Adults feed on squid and juvenile rockfish. The common name of this fish was derived from an old Native American legend, in which this fish was referred to as the ‘king’ who led the Salmon. See these (and find out more) at the Seaside Aquarium, on the Prom, in Seaside. 503-738-6211. Even stranger still, back around 45 million years ago, our beaches were nearly 100 miles inland, about where Silverton is now. The plate the U.S. sits on is continually crawling westward. 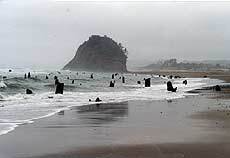 In mysterious (and oft-called spiritual spot) Neskowin, just north of Cascade Head and south of Pacific City, there’s a weird wonder nicknamed the "ghost forest." This downright spectacular oddity is almost a rare sight in Neskowin, but you may not know just how spectacular it is unless you know what it is you're looking at. They look somewhat like old, ragged pilings leftover from something manmade – and a little bit like the ghostly remnants of a woodland. They are, in fact, stumps of a forest some 2,000 years ago or so. As many as 100 are sometimes visible in various shapes and sizes. Initially, local geologists theorized that around 2,000 years ago a massive, cataclysmic earthquake abruptly dropped this forest possibly more than 25 feet. Then, they were preserved by sand and mud and a no-oxygen environment, rather then being destroyed and scattered, as natural erosion might've done. 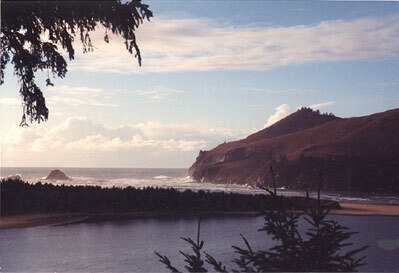 But in recent years, scientists have come to believe these and other ghost forests on the Oregon coast were the result of slightly longer geologic processes. 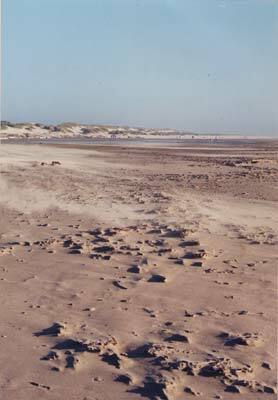 For a variety of reasons, the landscape changes in that area, and sand, sea or other elements flood the area over a period of years or decades. In 1970, a whale carcass washed ashore at Florence and caused quite a stir (and a smell). Back then, the Oregon Highway Division (soon to become Oregon Department of Transportation) decided to stick dynamite next to it and blow it to bits. It was, to say the least, a learning experience. A man named Thornton, who was the Highway Division's head of the project at the time, will still not speak to the press to this day. Back in 2000, the Eugene Register-Guard did a thirty-year retrospective on the infamous event and he refused comment. THE TIDES BY THE SEA, Seaside. For over 80 years a favorite of Seaside visitors. 51 oceanfront condos, individually owned and decorated. Suites for couples, small apartments with fireplaces and kitchenettes, one or two bed family units with fireplaces, kitchens and dining rooms. Oceanview cottages sleep anywhere from two to eight, w/ two bedrooms, some with lofts, fireplaces and kitchens. Heated outdoor pool, enormous grounds w/ picnic tables - all at quiet southern end of Seaside. 2316 Beach Drive. 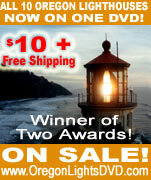 800-548-2846. www.thetidesbythesea.com.